Are changes in immunological/inflammatory mediators a cause or consequence of endometriosis? This article presents an overview of immunological factors and their role in the development of endometriosis, with emphasis on inflammatory cytokines, growth and adhesion factors. Although retrograde menstruation is a common phenomenon among women of reproductive age, not all women who have retrograde menstruation develop endometriosis. The development of endometriosis is hypothesised to be a complex process, which may be facilitated by several factors, including the quantity and quality of endometrial cells in peritoneal fluid (PF), increased inflammatory activity in PF, increased endometrial-peritoneal adhesion and angiogenesis, reduced immune surveillance and clearance of endometrial cells, and increased production of autoantibodies against endometrial cells. Potential biomarkers like cytokines and autoantibodies upregulated during development of endometriosis may be useful in the development of a non-surgical diagnostic tool. Although endometriosis can be treated using hormonal suppression, there is need for non-hormonal drugs, which can inhibit the development of endometriosis and alleviate pain or infertility without inhibition of ovulation. New molecules that modulate immune function in endometriosis should be the targets for future research. Endometriosis is a gynaecological disorder characterised by the presence and growth of endometrial tissues in the ectopic site. The endometrial deposits are mostly found in the pelvis (ovaries, peritoneum, uterosacral ligaments, pouch of Douglas and rectovaginal septum). The prevalence of endometriosis among asymptomatic women ranges from 2–22%, while in women with dysmenorrhoea, the incidence of endometriosis is 40% to 60% . It is the most common cause of pelvic pain and occurs in 13%-33% of women with infertility . Although endometriosis stands as one of the most investigated disorders of gynaecology , our current understanding of aetiology and pathophysiology of the disease remains elusive. Retrograde menstruation is a widely accepted and proposed mechanism that may explain mostly the presence of endometrial cells in ectopic sites . However, it does not account for the fact that these misplaced cells survive in women with endometriosis and not in healthy women. An immunological/inflammatory aetiology has been conjectured, as demonstrated by increased concentrations of activated macrophages, cytokines, T cells and B cells . The endometrial fragments desquamated during menstruation and deposited into peritoneal cavity, implant, proliferate and develop into endometriotic lesions. The development of endometriosis may be influenced by quantity and quality of endometrial cells in the PF, and by immune factors, including increased inflammatory activity in PF, impaired immune recognition and clearance of ectopic endometrial cells, and formation of autoantibodies. These factors will be discussed in this review. Several theories exist that attempt to explain the mechanisms involved in development of endometriosis, but Sampson's theory  of retrograde menstruation has gained most supportive evidence. Retrograde menstruation is the reflux of menses through fallopian tube to ectopic site especially the peritoneal cavity. Viable endometrial cells have been found in the peritoneal cavity during nonmenstrual phases of the cycle  and during menses (reviewed by D'Hooghe et al. ). Although retrograde menstruation occurs in 70–90% of women  and 83% in baboons , endometriosis is diagnosed in at least 10% of the former and 25% of the latter. If only a small percentage of all women who have reverse menstruation actually develop the disease, the puzzling enigma is why the pelvic environment becomes receptive to allow implantation and proliferation of endometrial cells and development of endometriosis? Other factors must be involved allowing retrogradely displaced endometrial tissue to implant and develop into endometriotic lesions. It has been hypothesized that the quantity of endometrial cells deposited into the peritoneal cavity during menstruation could be higher among women who develop endometriosis, as suggested by a positive correlation between the number of menstrual cycles and the prevalence, cumulative incidence and progression of spontaneous endometriosis in baboons (reviewed by D'Hooghe and Debrock ). Similarly, it is well known that women with short cycles and long duration of menstrual flow are more likely to develop endometriosis . Furthermore, outflow obstruction of menstrual effluent, resulting in excessive retrograde menstruation has been associated with endometriosis both in humans [9, 10] and in baboons . It may be possible that both dysmenorrhoea (painful menstruation) and endometriosis are manifestations of outflow obstruction . Peritoneal fluid (PF) in women with endometriosis is marked by increased inflammation, including increased volume of PF, increased concentration of white blood cells and macrophages, and increased activation status of these macrophages (reviewed by D'Hooghe and Hill ). These activated peripheral mononuclear cells as well as endometriotic cells in situ are hypothesised to secrete various cytokines with pleiotropic biological activities. Cytokines are low molecular weight proteins or glycoproteins typically synthesised by peritoneal macrophages, lymphocytes, ectopic endometrial implants or mesothelial cells of the peritoneum [13, 14]. Usually, inflammatory cytokines and growth factors are secreted and culminate in recruitment of numerous cell types to the peritoneal cavity . Aberrant expression of several cytokines by activated macrophages, such as interleukin (IL)-1, IL-6, IL-8 and TNF-α in peritoneal fluid of women with endometriosis compared to controls  may contribute to a peritoneal microenvironment, which favours the implantation of endometrial cells and the establishment of endometriosis . Indeed, as reviewed in the next section, cytokines like IL-8 and TNF-alpha are known to promote endometrial cell proliferation, endometrial adhesion and angiogenesis. Not only peritoneal macrophages, but also endometriotic lesions and mesothelial cells of peritoneal origin may secrete cytokines such as Tumor Necrosis Factor-alpha (TNF-α) and Interleukin-1 (IL-1) in women with endometriosis. These cytokines in turn modulate the stimulation of other cytokines and chemokines such as Interleukin-8 (IL-8) and RANTES (Regulated upon activation, normal T-cell expressed and secreted). RANTES is a potent attractant and activator of macrophages, T-lymphocytes and eosinophils [18, 19], while IL-8 promotes angiogenesis . In one study , a positive correlation was found between the rAFS stages of endometriosis and the concentration of TNF-α in PF. The concentration of TNF-α in PF was significantly higher in patients with stage III/IV disease (168 pg/ml) than in women with stage 1/II disease (60.2 pg/ml) or control patients (3.3 pg/ml) . TNF-α and IL-8 concentrations in peritoneal fluid have also been reported to correlate with the size and number of active lesions . The increased concentration of TNF-α reflects enhanced secretory activity of the peritoneal macrophages and not just the mere increase in the number of peritoneal macrophages . Does endometriosis lead to inflammation caused by an inappropriate and exaggerated immune response to ectopic endometrial debris? Or is endometriosis caused by peritoneal inflammation? Obviously, these cause-effect relationships cannot be studied in women for ethical reasons. In baboons, current evidence suggests that peritoneal inflammation is a consequence, not a cause of endometriosis. Firstly, in baboons, both spontaneous retrograde menstruation and experimental intrapelvic injection of endometrium are associated with intrapelvic inflammation (increased PF volume and increased PF concentration of white blood cells and inflammatory cytokines) [23, 24]. This peritoneal inflammatory effect is observed within one month after intrapelvic injection of endometrium (24), but disappears after 2 to 3 months later . Secondly, it has been reported that the WBC concentration and proportion of macrophages and cytotoxic T cells is increased in the PF of baboons with spontaneous endometriosis [25, 26]. Thirdly, the percentage of CD4+ and IL2R+ cells has been shown to be increased in the peripheral blood of baboons with stage II to IV endometriosis, (both spontaneous long term endometriosis and induced) when compared to those with recent spontaneous endometriosis (Stage I) or a normal pelvis. 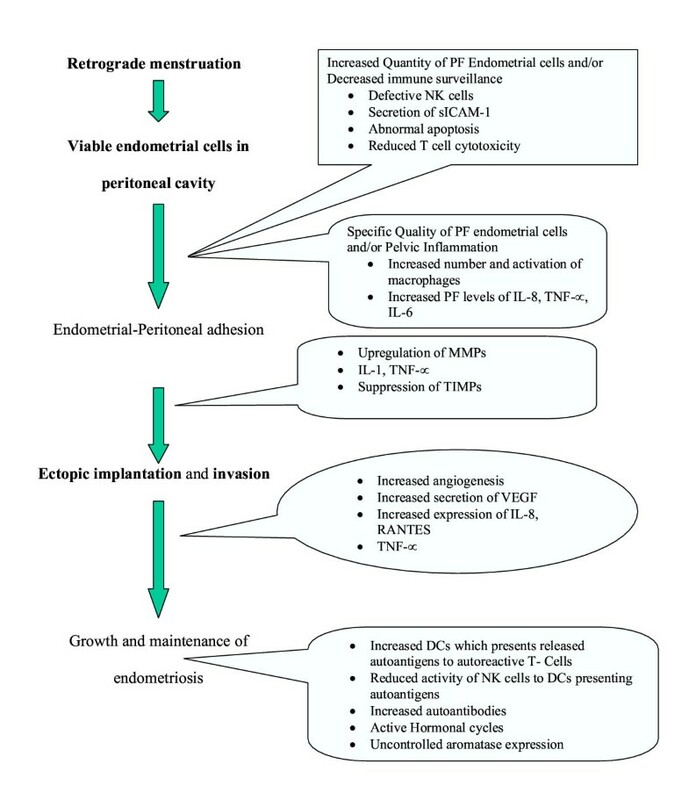 Even if peritoneal inflammation is a consequence rather than a cause of endometriosis [Fig. 1], the coexistence of endometriosis and peritoneal inflammation may offer new anti-inflammatory therapeutic options in the treatment of endometriosis. In an earlier study in baboons, a high dose of immunosuppression with azathioprin and methylprednisolone during 3 months did not affect the incidence of spontaneous endometriosis, the extent of induced endometriosis, and had a marginal stimulatory effect on the progression of spontaneous endometriosis , suggesting that overall immunosuppression does not have much effect on the incidence, prevalence or degree of endometriosis. Similarly, there is no evidence that the prevalence of endometriosis is higher in women using long term immunosuppression. However, more specific anti-inflammatory agents may affect the development of endometriosis. For instance drugs suppressing macrophage activation, such as verapamil (calcium channel blocking agent) and pentoxifylline, have been tested in hamster and mice respectively [28, 29]. Other drugs have also been tested in rodents and nonhuman primates, as is reported in the last section of this paper. A simplified view of the role of immune system in the development and maintenance of endometriosis. It illustrates the sequence of events leading to survival of endometrial cells in peritoneum, adherence, implantation, invasion and progression to disease. It has been hypothesised that the quality of endometrial cells in PF of women with endometriosis is different from women with normal pelvis. Viable endometrial cells from human endometriotic biopsies but not from human endometrial biopsies are invasive in an in vitro collagen invasion assay, probably because they have a higher proportion of potentially invasive E-cadherin-negative epithelial cells . Inflammatory cytokines (TNF-alpha, IL-8 and IL-6) produced by endometrial cells probably contribute to this adhesion process [31–33]. IL-8 has been shown to stimulate the adhesion of endometrial cells to fibronectin . TNF-α has been reported to also promote endometrial stromal cell proliferation in vitro  and endometrial stromal cell adhesion to extracellular matrix components . TNF-α may induce IL-8 gene and IL-8 protein expression in a dose-dependent manner, and the stimulating effect of TNF-α on endometrial stromal cell proliferation can be reversed by adding anti-IL8 antibodies . Does endometriosis then only occur among women with a high degree of endometrial-peritoneal adhesion? This is unknown at present, since it is impossible to study this process in women in vivo. Debrock and colleagues  reported a 80–100% success rate of endometrial-peritoneal adhesion in cultured explants after 48 hours, regardless of the presence or absence of endometriosis. Witz et al  showed endometrial adhesion occurs within 1 hour and transmesothelial invasion occurs within 18 hours. However, all these assays are merely descriptive and there is a need to develop a quantitative in vitro assay to measure endometrial-peritoneal adhesion. Endometrial quality can also be affected by local estrogen production in eutopic/ectopic endometrium. Indeed, the expression of uncontrolled aromatase mRNA in endometriotic lesions  suggests that a local estrogenic milieu is important in the development of endometriosis. It is possible that persistent expression of aromatase and 17β-hydroxysteroid dehydrogenase in endometriotic lesions may also be driven by a T-like autoantibody response [Table. 1]. Indeed, autoantibodies recognising T-like antigens have been reported to be upregulated in endometriosis and may trigger the synthesis of cytokines such as IL-1, TNF-α and IL-6, which in turn may induce the expression of aromatase and 17β-hydroxysteroid dehydrogenase in endometriotic lesions . Macrophage derived cytokines like TGF-beta and VEGF are suggested to contribute to the development of endometriosis by promoting neovascularisation of endometrial cells attached to the peritoneum [16, 38]. Increased angiogenesis is reported to be common around the peritoneal explants and increased angiogenic activity has been observed in PF from women with endometriosis . For instance, vascular endothelial growth factor (VEGF) has been detected in high concentration in PF from women with moderate to severe endometriosis [40–42], and is also secreted in endometriotic lesions, possibly as a downstream consequence of proinflammatory cytokine IL-1β activity [40, 41]. VEGF is involved in the development of blood vessels, that are critical in the growth, and maintenance of ectopic endometrial implants. After attachment, endometrial cells invade the extracellular matrix, a process influenced by matrix metalloproteinases (MMPs). MMPs are a group of enzymes important for the control of extracellular matrix turnover . MMPs are upregulated by TNF-α and IL-1, which could contribute to the invasiveness of endometrial fragments in women with endometriosis . TNF-α may also contribute to the decreased expression of endogenous tissue inhibitors of MMPs (TIMPS) under in vitro conditions . Both the downregulation of TIMP and increased expression of MMPs may support the invasive growth of endometriotic explants (Fig. 1). It has been postulated that the hemopexin domain expressed by most MMPs is involved in this process of MMP upregulation. Hemopexin is a Thomsen-Friendenriech antigen bearing serum protein that binds to jacalin. A hemopexin domain with high sequence homology to plasma hemopexin is expressed by MMPs except MMP-7 and can be recognised by T-like autoantibodies in women with endometriosis . It has been postulated that the binding of T-like autoantibodies to the hemopexin domain may lead to dysregulation of the expression of MMPs and TIMPs in ectopic lesions, leading to increased invasiveness of these lesions in women with endometriosis (37). However, the role of autoantibodies in the development of endometriosis remains an area of great interest and ignorance, as reviewed before , even though new reports have suggested that in women with endometriosis B-cell activity is altered accompanied by increased incidence of autoantibodies [47, 48]. Defective natural killer cells activity? Retrograde menstruation occurs to some degree in all women. Therefore, it has been hypothesised that the clearance of endometrial cells within the pelvic cavity could be decreased among women with endometriosis. A defective cellular immunity (Fig. 1), especially impaired natural killer (NK) cell function may contribute to the survival and ectopic implantation of sloughed endometrial cells. Wilson and colleagues  reported decreased NK cells cytotoxicity in women with endometriosis. D'Hooghe and colleagues  documented no difference in lymphocyte-mediated cytotoxicity and NK cell activity between baboons with and without endometriosis. A dysfunction of two subclasses of NK cells may nurture autoimmunity associated with endometriosis . One subset, NK T cells, is characterised by the capacity to kill cell target and secrete cytokines, such as IL4 and IL-10, which are important in the regulation of autoimmunity . Another subset of NK cells, CD16/CD56 NK cells kills autologous dentritic cells (DCs) presenting self-antigens to autoreactive T cells. The inability of NK cells in eliminating autologous DCs expressing endometrial self-antigens, may allow their presentation to autoreactive T cells and the production of autoantibodies . The failure of NK cells to scavenge autologous endometrial cells may allow development of endometriosis. It has been hypothesized that natural killer cells in the endometrium can attack the implantation site of the embryo as it tries to attach to the uterine wall and that autoantibodies can play a role in this process . However, a recent review has shown that there is no proven relationship between abortion, recurrent abortion and endometriosis , and at present there is no proof that endometriosis-associated subfertility is caused by impaired embryo implantation. CD4 T cells are divided into type1 (Th1) helper T cells which secrete interleukin (IL)-2, IL-12 and interferon γ and type2 (Th2) helper T cells, which secrete IL-4, 5, 6 10, 13 . Cell-mediated immunity, including T-cell-mediated cytotoxicity is activated or suppressed by cytokines produced by Th1 and Th2 cells, respectively. Under normal conditions, there is a tightly regulatory control mechanism between Th1 and Th2 cells. For instance, Th1 cells secrete IL-12, which activates cytotoxic NK cell activity, whereas Th2 cells may reduce NK cell activity by producing IL-10 . In women with endometriosis, Th2 helper cells from PF are reported to aberrantly suppress cell-mediated immunity by upregulating IL-4 and 10 secretions in PF from women with endometriosis [38, 55]. As a result, decreased T cell cytotoxicity may allow implantation of endometrial cells in peritoneum. The failure of immune cells to transmit death signals to endometrial cells, and/or the ability of endometrial fragments to avoid cell death may be associated with the development of endometriosis. Indeed, in women with endometriosis, it has been hypothesed that endometrial cells in the peritoneal fluid avoid immunosurveillance and implant into peritoneum . It has been speculated that lymphocytes can adhere to endometrial cells through the Lymphocyte Function-Associated Antigen-1(LFA-1) – Intercellular adhesion molecule-1 (ICAM-1) dependent pathway and present them as a target to NK cells. Soluble forms of ICAM-1 (s-ICAM-1) secreted by PF endometrial cells/endometriotic lesions can also bind to LFA-1 presenting lymphocytes and could prevent the recognition of endometrial cells by these lymphocytes and prevent subsequent NK cell-mediated cytotoxicity [57, 58]. Furthermore, IL-6 secreted by endometriotic cells in concert with interferon-γ may upregulate sICAM-1 production by macrophages of patients with endometriosis . As a result, increased secretion of sICAM-1 may allow endometrial fragments to evade immunosurveilance, survive and implant. Another major pathway in programmed cell death, Fas-Fas Ligand (FasL) system, could also be abnormal in women with endometriosis [60, 61]. It has been speculated that the expression of FasL by viable endometrial cells induces apoptosis of T cells through ligation of Fas, allowing endometrial fragments to escape cell death, implant and develop to endometriotic lesions . Interestingly, Garcia-Velasco et al  showed that macrophage-conditioned media might stimulate Fas-Fas ligand (FasL) expression by endometrial cells. Presently, the diagnosis of endometriosis can be made only by laparoscopy and biopsy of suspicious lesions with subsequent histological confirmation of endometrial tissue and there is no non-invasive way to diagnose this condition. Laparascopy is minimally invasive procedure, but requires general anaesthesia and surgical skills with potential complications and procedural costs. Hence, a non-surgical diagnostic tool would be of paramount benefit to both physicians and patients. Efforts to evaluate the diagnostic value of endometrial markers for endometriosis have been hampered by the lack of easy, reliable and quantitative techniques to assess the expression levels of these markers in sample material. Emerging proteomic techniques offer new approaches to identifying biomarkers for the early detection and follow-up of endometriosis. Aromatase P450 mRNA has been identified as a candidate diagnostic marker but low sensitivity and specificity impair its application in clinical practice (Reviewed by Brosens et al ). In a recent study , the measurement of serum IL-6 levels and PF TNF-α levels could discriminate between patients with endometriosis and those without the disease. Endometriosis could be diagnosed if TNF-alpha levels in PF were higher than 15 pg/ml (100% sensitivity and 89% specificity) and if IL-6 levels in serum were above 2 pg/ml (90% sensitivity and 67% specificity) . Potentially, the quantitation of autoantibodies against endometrial cells could also provide a novel method for the non-invasive diagnosis for endometriosis . However, more studies are needed to confirm that this approach may be clinically useful. The role of Transvaginal Ultrasonography (TVU) and Magnetic resonance Imaging (MRI) in diagnosis and follow up of small endometriotic lesions is limited at present, but represents an interesting area of research . Endometriosis causes pelvic pain and infertility and can be treated by surgery and by hormonal suppression (progestins, continuous use of oral contraceptives, danazol, GnRH agonists), as reviewed recently . A drug like danazol also works as an immunosuppressive agent (reviewed by D'Hooghe and Hill ). Indeed, the immunologic effects of danazol have been studied in women with endometriosis and adenomyosis and include a decrease in serum immunoglobulins [67, 68], a decrease in serum C3, a rise in serum C4 levels , decreased serum levels of autoantibodies against various phospholipid antigens [67, 68], and decreased serum levels of CA125 during treatment [69–72]. Danazol inhibits peripheral blood lymphocyte proliferation in cultures activated by T-cell mitogens but does not affect macrophage-dependent T-lymphocyte activation of B lymphocytes . Danazol inhibits interleukin-1 (IL1) and TNF production by monocytes in a dose-dependent manner  and suppresses macrophage/monocyte-mediated cytotoxicity of susceptible target cells in women with mild endometriosis . These immunological findings may be important in the remission of endometriosis with danazol treatment and may offer an explanation of the effect of danazol in the treatment of a number of autoimmune diseases, including hereditary angioedema , autoimmune hemolytic anemia , systemic lupus erythematosus, and idiopathic thrombocytopenic purpura [78, 79]. Overall, medical treatment of endometriosis is limited by cost, side effects and recurrence of endometriosis after the cessation of treatment. Therefore, there is need for new drugs that treat endometriosis-associated pain and infertility without inhibition of ovulation. Future potential targets in the treatment or management of endometriosis may be inflammatory cytokines, MMPs, adhesion and growth factors [80, 38]. Pentoxifylline has been shown to reduce endometriotic implant growth without inducing hypoestrogenism in both humans and hamsters . In a recent study, Hornung and colleagues  demonstrated that Thiazolidinedione (TZD) significantly reduced leukocyte infiltration in the mouse model with endometriosis. Inhibition of TNF-alpha activity has also been a new target in the prevention and treatment of endometriosis. Experimental endometriosis in rats was treated with recombinant human tumour necrosis factor-binding protein-1 (r-hTBP-1), a soluble form of tumour necrosis factor-α receptor type-1 . It was demonstrated that r-hTBP-1 could reduce the size of endometriotic-like peritoneal lesions by 64% . Similarly, a study carried out in baboons showed that r-hTBP-1 effectively inhibited the development of endometriosis and endometriosis-related adhesions . The potential of etanercept, a soluble TNF receptor (TNFR) fusion protein, for the treatment of endometriosis is also being considered . Understanding the involvement of the immune system in the development of endometriosis may help to understand the pathogenesis and spontaneous evolution of this condition. At present, most evidence suggests that pelvic inflammation and other immunological changes are a consequence of endometriosis. The development of a non-invasive diagnostic tools based on cytokines and autoantibodies could be of great benefit in the clinical management of endometriosis. Therapeutic strategies to eliminate the inflammatory reaction associated with endometriosis could lead to new treatment options for endometriosis.